Sheets 31-32. (Cary's England, Wales, and Scotland). Most of the common land in Hertsfordshire is included in this map, which covers Bromyard Down, Badley Wood, and Bringsty Common. Sutton Walls, an Iron Age hillfort, is north of the River Lugg. 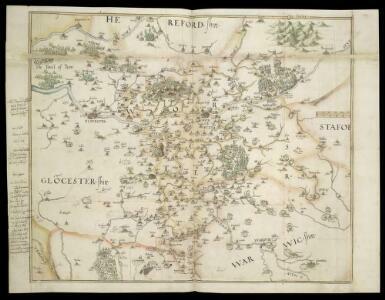 Budgen, T.
Description: This is a manuscript map of Worcestershire. The date and draughtsman are not known. It forms part of an atlas that belonged to William Cecil Lord Burghley, Elizabeth I’s Secretary of State. Burghley used this atlas to illustrate domestic matters. The dominant features of the landscape are the waterways and the parks which are shown by symbols of fenced enclosures. These were of central importance to any military campaign. The fastest way to move a lot of men and weaponry was by river and parks provided somewhere for troops to set up camp and for horses to graze. Lord Burghley has annotated the map. In the left margin he has added a list of residents of the area and what lands and properties they are associated with, inserting some of these into the map itself. This is a good indication of how detailed was the knowledge accumulated by Burghley.